Insert the ends of the mounting brackets into the sliding rails. Caution - The weight of the servers on extended slide rails can be enough to overturn an equipment rack. Caution - The 2U server weighs approximately 55 lb (25 kg). 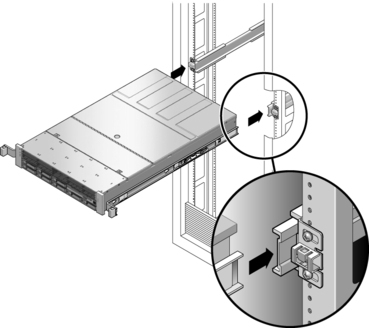 Two people are required to lift and mount the server into a rack enclosure when using the procedures in this chapter. Caution - Before continuing, verify that the server is securely mounted in the rack, and that the slide rails are locked to the mounting brackets. Deploy the antitilt bar, if the chassis or rack has an antilt bar. Slide the chassis into the rack.